Fig. 1. Women kneading dough. Terracotta figurine fromThebes. Louvre Museum (Pingiatoglou 2010, p. 43). 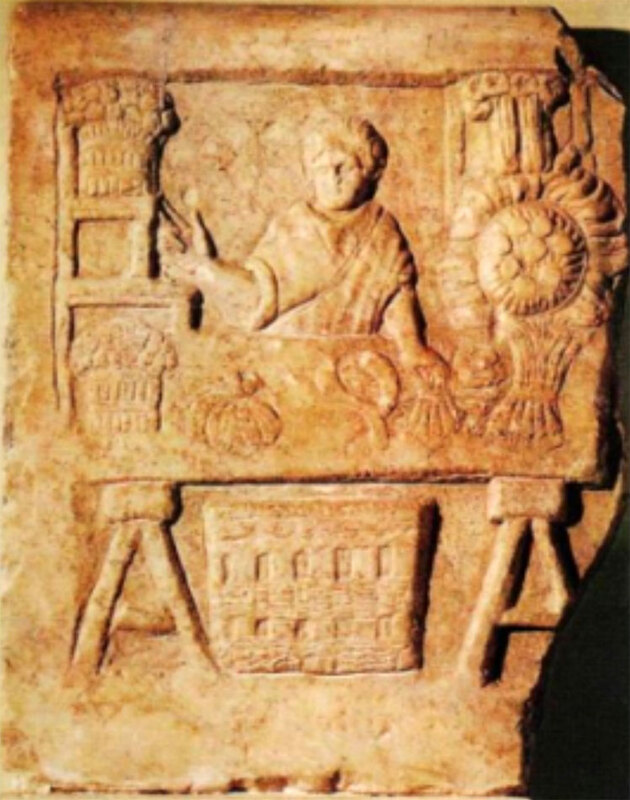 In the past, the topic of nutrition in antiquity and the Byzantine period has been of interest both to many scientists and the magazine Archaeology and Arts. In this current special article series made up of four contributions, “The cuisine of the Ancient Greeks and Byzantines” are approached from different perspectives. Specifically the first two articles entitled “The nutritional habits of the ancient Greeks” by M. Girtzi and “the Byzantines’ perceptions on nutrition” by E. Albanidou examine from a historical and archaeological point of view “how and what was eaten” by the ancient Greeks and Byzantines, meaning what types of food they consumed and the manner that they purchased it, the meals, the etiquette of banquets or official dinners of each era etc. The two last articles with the common title “Ancient Greek and Byzantine nutrition: teaching history in an experiential way” by M. Girtzi and P. Kourtes, constitute museum related pedagogical and didactic approaches. They present two projects “Dining in ancient Greece” and “Dining in Byzantium” whose design was based on museum related pedagogical and didactic methods of today and were realized experientially by primary school students from the Fourth and Fifth grades respectively. In his book Περί διαίτης (On nutrition) Hippocrates “the father of medicine” in giving nutritional advice argues that “during the winter a person should eat as much as possible, drink as little as possible and the wine should be as diluted as possible. He can eat cooked meat and fish and vegetables cooked as little as possible. With the coming of spring, when we drink more, the wine should be more diluted and drunk in small sips, we should eat soothing food and in smaller amounts, use barley flour for bread, eat less […] and all food to be boiled […]. In summer we should eat soft dough made of barley, drink a lot of watered down wine and all foods to be boiled. This is what we should consume in the summer for our bodies to be fresh and relaxed, since this time of year is hot and dry, inflaming the body and depriving it of moisture. We must take precautions under these conditions […]. In autumn we should return to a richer and drier diet with the appropriate food, less wine which should be less diluted, thus allowing the winter to smoothly take its course”. Most information from the sources, both archaeological finds and texts of ancient Greek writers, is primarily concerned with the diet of the ancient Athenians. Consequently most of the following references are mainly related to ancient Athens, although existing data from other regions is also listed. Naturally the “cooking” of each district is, for a start, inextricably linked with the soil’s productivity and then with commerce and therefore the import of products. As a result, in the Greek islands, for example, the locals consumed mainly fish, goat, dairy products and dried fruit, while in Northern Greece they ate a lot of both sea and fresh water fish as well as game. Thessaly, on the other hand, was famous for its bread, cheeses and variety of meat (note 1). One can acquire some idea of how these products were cooked by reading Ηδυπάθεια (Voluptuousness), the first cookery book written in the 4th century by Archestratos from Syracuses after his travels in the Mediterranean during which he sampled the local dishes. Among other things, the “father of gastronomy” advises that special attention be given to ingredients and their harmonious combinations, that rich sauces be avoided as well as spicy ingredients and excessive seasoning. A subsequent attempt shall be made to answer two basic questions: what and when did the ancient Greeks eat and drink? What did the ancient Greeks eat and drink? 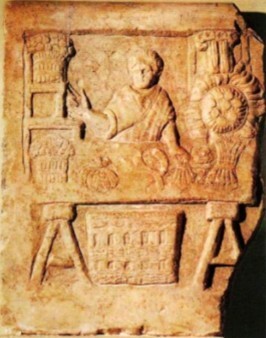 Cereals, one of the basic foods of the ancient Greeks are among the goddess Demeter’s gifts to mankind and in fact derive their name “demetriaka’’ from the goddess herself. During the 5th century B.C. they were widely cultivated in the fertile regions of Thessaly, Boeotia and the Peloponnese, while in more arid areas like Attica and the islands, where production was limited, cereals were imported from the Black Sea and Magna Graecia colonies. Barley (“krithe”) and wheat (“sitos”) were the cereals that were consumed in different ways and in greater quantities. Wheat grains could be eaten ungrounded after being roasted in a special frying pan, the “frygetron”, while according to Hippocrates in his book Περί διαίτης (On nutrition), II.40, barley grains were the basis of revitalising drinks. Cereals were usually ground by the “sitopoios” (wheat maker/miller), more rarely in an individual’s home, and were then used to prepare various foods. For a start, different types of porridge was made, either of ground bulgur wheat called “chondros” or ground bulgur barley usually mixed with water, but occasionally with honey, milk or wine. Wafers as well as sweet and savoury pies were made and also bread of course . There were two basic types of the latter, barley bread known as “maza” and wheat bread called “artos”. The “maza” – often accompanied by vegetables – was basically the food of poorer citizens and slaves but also, according to a law of Solon, the food of the members of the Vouli, the “Prytaneis” sustained by the Athenian Demos (Athenaeus, Deipnosophists, IV.137e). According to Hesiod (Έργα και Ημέραι (Works and Days), 588-592), it was made in the kitchen (“optanio”) of each home, out of barley flour (“alphita”), water, oil or milk. The “artos” consisted of finely ground wheat flour, leavened or unleavened. It was also made at home, but on a bigger scale it was produced by “artopious” (bakers), who had special stores or stands in the Agora of Athens, for example. They constantly experimented with its size, shape and additional ingredients such as olives, cheese, sesame and poppy seeds etc. As a result, Athenaeus recorded 72 types of bread among which are the following: “apalos artos” (soft bread) made of flour, leaven, water, milk, oil and some salt, “artolaganon” (flour, water, wine, pepper, milk, oil or fat), “streptikios” (flour, water, milk, pepper, oil or fat), “kyvos” (cube; a square bread with dill, cheese and oil), “sesamites” (bread with sesame seeds). Sometimes the bread was named after the way it was baked: on a grill/“skara” (“eskarites artos”), on embers (“spondites artos”), on charcoal (“autopyrias” and “epanthrakis”) in moulds (“ovelites artos”), in a pitcher (“ipnites artos”), in an oven (“klivanites artos”). More rarely bread was made of zea, maize (“chondrites artos”), rye (“artos ex olyron”), rice (“orinthou”) or semolina (“krivanites artos”). Bread was eaten plain, dipped in either milk or undiluted wine (“akratos oinos”) with vegetables and cheese. Of course there were some breads made for special occasions such as the feast days of the Thargelia (“thargelon” or “thalysios artos”), Arrephoria (“anastatos”), and Thesmophoria (“achainas”). The “plakountas” (cake) was the most well known pie in antiquity and was made at home or in the workshop of a “cake maker”. It was basically dough made of top quality flour and water to which were added various ingredients such as milk, cheese, eggs, oil, fat, dill, fennel, cumin, pepper, walnuts, almonds, raisins etc. to create various pies (e.g. the “artotyros” or “tyron artos”, the cheese pie (tyropita) of today). There were other sweet pies, such as the melopita (“melitoutta”/honey pie), one sweet made of dough, sesame and honey (“omoro”), another of linseed and honey (“chrysokolla”), one made of flour, cheese and honeyed wine (“ekhyto”), another of flour or semolina, water and ripe dates (“egryphias”) and pancakes (“egrides”) as well. Last in the bread category was the plain rusk (“dipyron”), the puffed rusk (“physema”), a type of bun made of roughly ground rye (“kollyras”) etc. Pulses were another basic ingredient of the ancient Greek diet. Broadbeans (“kyamos”), lupins (“thermos”), lentils (“faki”), peas (“pisos” or “pison”), or chick peas (“erevinthos”) resembling a type of porridge, make up the “etnos” which was the staple diet of the poorer classes and according to Aristophanes (“Frogs”, 62-63), Hercules’ favourite dish. Pulses were also eaten fresh, dry like dried fruit or cooked. The following fresh vegetables were eaten as salads, usually in rural areas, while in towns they were served cooked and seasoned: cabbage (“kramve” or “rafanos lachanodis”), lettuce (“thridax”), wildartichokes, marrow (“kolokynthos”), cucumbers (“sikyos”), carrots (“staphylinos”), onions (“kromyon”), garlic (“skorodon”, the ones from Megara being the most well known), leeks (“praso” or “kefaloton” or “gethyllida”), asparagus (“asparagus”), turnips (“teuftlon” or “leimonion”), celery (“petroselinon”), radishes, mushrooms (“myketes”), chicory (“kichorion”), nettles (“akalephe”), greens (“vliton”). It is true to observe that tomatoes and potatoes were unknown to the ancient Greeks. The olive tree, goddess Athena’s gift to the citizens of Attica provided oil and olives as equally important basic nutrients. Black olives were eaten pickled (“almades”), crushed (“thlastai”) or as a paste, while the green ones were preserved in salt, water and vinegar (“kolymvades”). Olive oil was the only type of vegetable fat used for cooking but also just as usual an ingredient for seasoning ,among many other herbs. On display in perfumeries (“myropoleia”), one found laurel, Apollo’s sacred plant, basil (“okimon”), dill (“anesson”), parsley (“oreoselinon”), chervil, mint (“minthe”), spearmint (“hedyosmos”), coriander “coriannon”), rosemary (“livanotis”), oregano (“origanos”), thyme (“thymo”,the best being that found on mount Hymettus), marjoram, cumin (“kymino”), fennel, mustard seed (“sinapi”), saffron (“krokko”), poppy seed (“mekon”), linseed, savory (“thymvra”), sage etc. All the above were grown in Greece, but there were also imported seasonings such as, for example, aniseed from Egypt and silfion from Libya. Most herbs were also used for their medicinal qualities (e.g. parsley was used to lower high blood pressure, laurel to cleanse the blood, “akantha” to clot the blood, chicory and dill to soothe the stomach). The fertile regions provided ancient Greek households with a variety of fruit such as figs (note 4), pears (“apia”), apples (“mela”), plums (“kokkymela”), peaches (“Persian apples” obviously originating from Persia), apricots (“Armenian apples” from the Caucasus area), quinces, medlars (“mesmila”), bearberries (“mimaikyla”), grapes (“votryes”), melons (“pepon”), watermelon (“melopepon”), cherries (“kerasea”), strawberries (“chamaikerasos”), mulberries (“sykamina”), pomegranates (“roai”) etc. The above, however, do not include oranges, bananas and mandarins. Usually fruit was eaten fresh, but also cooked with meat and fish or used as an ingredient in a sauce. Very often they were eaten as dried fruit (e.g. figs, raisins) together with a variety of nuts such as walnuts (“karya”), almonds (“karya ellenika/Greek walnuts” of which the most well known come from Naxos), hazelnuts (“ karya pontika/walnuts from the Pontus” or “leptokarya”), chestnuts (“karya euboeika/walnuts from Euboea or kastana- ika”) and pistachios. In antiquity, fish was a basic part of nutrition. There were professional fishermen even though Plato in his Νόμοι (Laws), 823e, considers fishing to be “an activity not suited to a well bred man” and Plutarch in Πότερα των ζώων φρονιμότερα (Which animals are the most intelligent, IX) claims that “it is not an important activity worthy of a free man”. 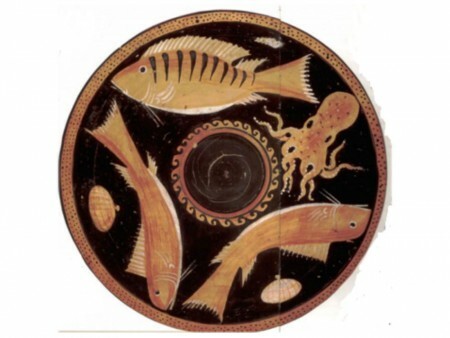 “Ichthys” was the ancient Greek word for fish, but later it was also called “opson” (a word that originally applied to anything eaten with bread such as greens, onions, olives, meat, fish, fruit, sweetmeats etc). It was widely consumed even by the poor, being considerably cheaper than meat since, according to Aristophanes in his play “The Knights”, 649, “smoked fish or a helping of sardines cost 1 obol”. As Aristotle comments in his “Ιστορίαι περί ζώων/stories about animals”, 592a, demand was so great that there is evidence that apart from fishing, there were seafood (eels and shellfish) farms and special places for curing fish. In the ancient Agora of Athens with its abundant “fish stalls”, the arrival of a cart with fresh fish was announced by the ringing of a special bell. Sardines and anchovies – the ones from Faleron being the most famous – were popular among the poorer classes while tuna – fished in great numbers on the shores of the Mediterranean or in the sea of Marmaris – was the most popular species for the majority of the ancient Greeks. Besides the above, the following fish were consumed: sea bass, bonito, monkfish, bream, mullet, skate, scorpion fish, red mullet, sword fish, turbot, moray eel, conger. Fresh water fish were also eaten such as perch, carp, minnows, eel (the best eels came from lake Kopaida or the Strymon river). Last on the list are the following variety of seafood: octopus, lobster, shrimps, crabs, cuttlefish, squid, oysters, sea urchin, limpets, mussels etc. Fish was cooked in different ways (as a soup, roasted or boiled) and could have a variety of seasoning, such as, for example, stingray with silfio and cheese, tuna fish with a sauce made of garlic, leeks , cheese, olive oil and eggs ( the “mitotos”). Fish could also be served with vegetables or fruit as for example, bream with prunes and eel with white beet. Last it was possible for it to be eaten as “tarachos” (salted fish marinated in oil) served with bread or rusks. If fishing was not suitable for aristocrats, the same did not apply to hunting about which Xenophon claims, in his book “Kynegetikos” (On Hunting) that “it is a part of education and one should start being initiated to its techniques in adolescence”. It was a pastime for both aristocrats and peasants but also a job for those who supplied the market and the symposia of the rich with a variety of game (hare, boar, deer, partridge, quail, blackbirds, larks, finches etc). In some districts, apart from hunting, larger or smaller herds of animals were bred, such as cows, oxen (“vous”), pigs (“delphax” or “choiros”), sheep, goats (“aigha”), hens (“ornitha”), ducks and geese. 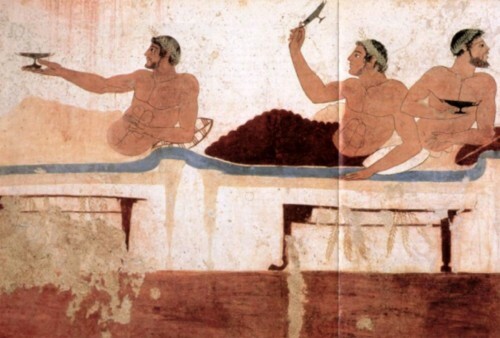 Considering that meat was extremely expensive (note 7), the majority of ancient Greeks made the most of rare opportunities for a free meat dinner offered by sacrifices . Plutarch in his book Συμποσιακά προβλήματα (Symposium problems) points out “that it is only proper” that the slaughtered animal whether ox, goat, lamb or pork “should be pure, healthy and unblemished in body and soul”. It is also a well known fact that, on the one hand, the animal’s entrails were cooked to be eaten by a privileged group of people, while the rest of the meat, either roasted (“ovelous”) or boiled (“pnikto”), was offered to all those present (note 8). Plato in his “Republic”, 404b-d, advises young people “not to eat fish, but roasted meat instead without sauces and seasoning”. Meat, as Hippocrates advises in his book Περί διαίτης (On nutrition, ΙΙ.46), was preserved in salt (“apexirameno”/dried), vinegar or wine and cooked, mainly in the homes of the rich, with seasoning from various herbs (thyme, garlic, meconium, sesame etc.) and served with vegetables. A special case of meat consumption is the “melanas zomos” (black broth) which was a local delicacy in Sparta consisting of pork, blood, fat, vinegar and salt. The lower classes rarely ate meat, but they had easy access to dairy products and eggs. Specifically, the ancient Greeks ate the following variety of cheeses: the soft cheese of Sicily (“trofalis”), cream cheese (“chloros tyros”), soft cheese of goat’s milk (“tromalikos tyros”), spicy cheese with fig juice (“pias”), crushed cheese with pepper (“koptos tyros”) but also butter (“pion galaktos”) and yoghurt (“pyriates”). Eggs were boiled (“pnikta” or “hemipagea”), fried with milk and cheese as a “oothrion”, meaning omelette, or sucked. The vine, a gift to the mortals from the god Dionysus, provided wine (oinos), the ancient Greeks’ most prevalent drink served at the meals of both the rich and the poor. Indeed, Thucydides argues that “the people of the Mediterranean put their barbarous phase behind them when they learnt to cultivate the olive and the vine”. The following regions were famous for their vineyards: Thrace (wine from Ismaros), Thasos, Mende, Thessaly, Skopelos, Chios, Lesbos, Lemnos, Samos, Rhodes, Naxos, Crete, Kerkyra and many other places as well as we can see from the enormous variety of seals on the pointed amphora used for the wine’s transportation. For its better preservation, the wine was mixed with sea water or other ingredients such as honey/“meli” (“oinos melitis”), mint (“oinos kalamanthitis”), dill (“anethos oinos”), dried figs (“oinos sykites”), dates (“phoinikios oinos”) as well as laurel leaves, cinnamon, thyme etc. Since, however, there were no sulphite formulations for the wine to keep, it quickly turned into vinegar. In ancient Greece wine was seldom drunk neat, “akrato”, since it was routine to dilute it with water so as not to reach the drunken state of the barbarian Scythians and Thracians that Plato finds fault with (Νόμοι/Laws, 637d-e). Indeed , Theognes from Megara also points out the measure declaring that “excessive consumption of wine is harmful, but if drunk in moderation can be healthy”. Likewise, Athenaeus in his book Deipnosophists, II.36b-c, adopting the words of Dionysus from the comedy by the poet Euvoulos, claims specifically that the god himself “recommends that the sensible drinkers restrict themselves to three craters (cups) of wine, since the first is good for the health, the second for love and pleasure and the third for sleep, because with the last one, wise men return home with ease. The fourth krater causes hubris (swearing), the fifth commotion, the sixth drunkenness, the seventh swollen eyes, the eighth invites trouble with the person responsible for keeping order, the ninth causes anger and the tenth a drunken mania”. A distinct form of “wine” was the “oinos ek krithon” (barley wine), today’s beer, which according to Aristotle (Athenaeus Deipnosophists, I.34) “brings on sleep” and “makes people fall on their backs when drunk” while with every other type of wine “they fall on their faces because their head becomes heavy”. Apart from wine, the ancient Greeks drank the following: water which they often mixed with herbs to give it a better taste, milk and sour milk (“oxygalo”), a mixture of water and honey (“hydromeli”) and also a thick beverage called the “kykeon” made of water, roasted barley flour, cheese, either mint, thyme or pennyroyal and honey. The latter, although considered a peasants’ drink, as referred to by Aristophanes in Ειρήνη (Peace, 712, 1169), was consumed in great quantities at the Eleusinian Mysteries, while also being considered a unique medicine for indigestion. When did the ancient Greeks eat and drink? The ancient Greeks began their day by eating breakfast (“akratisma”) at sunrise. It consisted of bread or rusks dipped in undiluted wine, sometimes served with olives and figs. Lunch (“ariston”) was usually quick and quite plain, since the main meal was eaten in the evening (“deipnon”/dinner). Occasionally a small afternoon meal (“esperisma”) was served and some other times, according to the recommendations of Hippokrates (Περί αρχαίας ιητρικής/On ancient medicine, 10-11), the “ariston” could be left out entirely. The “deipnon” took place at home either with the participation of all family members or as the initial phase of a “symposium” attended by the host and his friends. Plutarch, moreover, points out in his Συμποσιακά προβλήματα (Symposium problems) that for the ancient Greek “it was considered unthinkable to dine alone since in that case he would not be having a meal but simply filling his stomach like an animal”. 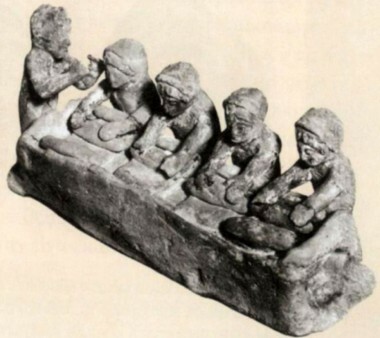 Boys were sometimes allowed to attend “symposia” but, as Plato informs us in Νόμοι (Laws, 666a), they were strictly forbidden to drink wine other than at certain phases of the symposium so as to benefit from discussions and prepare for their transition to adult life. Besides, it is no accident that during his rite of passage into adulthood, a young Athenian man was presented with armour, a sacrificial ox and a “kylix” (drinking cup) to participate in “symposia”. Naturally the presence of female members of the family in whichever phase of the symposium was strictly forbidden. Thus, an obvious segregation was established between the two genders into active male citizens and housebound women with no place in public life apart from their participation in religious activities. The symposia were usually organized by the rich and more rarely by the members of some society (“etairia”) where everyone brought along something (“eranos”/collection). The circumstances varied, from happy events (e.g. a birth, a wedding, a good harvest, somebody’s departure or return), victory celebrations for either an athletic or dramatic contest, events of mourning such as funeral suppers et al. A maximum of 12 specific individuals were invited, who all had to be adult citizens. On several occasions some people turned up uninvited, called “parasites” by Xenophon in his (Συμπόσιο/Symposium Ι.11). The symposium took place in a special part of the house, the “andronas” (men’s apartment) which was elegantly decorated with a specific number of “klines” (couches) arranged around the room in a Π shape to accommodate the guests in pairs or threesomes in seats chosen in advance. The time of the symposium was strictly arranged, meaning that it started early in the evening and ended early the following morning. The host received his friends in the entrance of the house where the slaves took off the guests’ shoes ,washed their feet and set wreaths on their heads of flowers and branches of ivy, vine, laurel or myrtle. On the one hand, these wreaths placed the guests under the protection of Dionysus or Apollo and on the other they would protect them from a headache during the drinking of wine. Etiquette demanded that prior to the guests entering the “andronas”, they should circulate in the various communal rooms of the house and make flattering remarks about the decoration. The “deipno” (dinner) preceded, during which, as Xenophon informs us in Symposium, Ι “the moment the guests take their seats , the servants bring them a basin with water to wash their hands (“chernips”) and then in front of each couch they place a table loaded with different foods already divided into portions. They eat with their fingers and quite fast”. Although spoons and knives ,but not forks, were known in antiquity ,people preferred to eat with their hands and then to wipe them with the breadcrumbs. The “deipno” (dinner) began with the “propoma”, a “kylika” (goblet) full of wine made of juice from different fruit mixed with honey. This was handed to each guest in turn to take a sip. The foods offered at a dinner were filling and very often included fish, poultry and more rarely red meat. Athenaeus in his Deipnosophists (II.28), citing such a meal, mentions characteristically that “eels made their appearance, fat and almost entirely covered with salt… They brought in the big stomach of a fish… when we had also finished with that, they brought us platters, one with a piece of dogfish, the other with a fat squid, the third with an octopus and hot polyps”. Many more types of food are mentioned by the same author as dishes for the “deipno” of some symposium, as for example: hare cooked in mint and thyme, roast thrush and quail, baby lamb, suckling pig on the spit, split peas, cheeses, cakes and other sweetmeats. It is worth noting that during the meal, usually no wine was offered other than the “propoma”. At the end of the meal, the slaves brought basins with water for the guests to wash their hands, then they cleared the space of leftovers and collected the tables. Next they brought in other tables loaded with titbits (“tragemata”) namely fresh or dried fruits (mainly figs), nuts (mainly dried beans orchickpeas), sweets and wine for the next phase of the symposium to begin. It often happened that some guests arrived after the “deipno” so as to participate only in the wine drinking phase (“potos”). The signal given for the start of this phase, as mentioned by Plato in «Συμπόσιο», 176a was the drinking of a little “akratos oinos” (neat wine) in honour of the “agathos” (good) daemon accompanied by libations, the burning of incense and singing of hymns to Dionysus and other gods. Next the throwing of dice randomly selected a man to take on a special role, that of the “lord of the symposium” or “symposiarch”. His obligations as head of the symposium were many and he had to be obeyed unconditionally . For example, the symposiarch decided on the wine’s dilution ratio (either 3 to 1 or 2 to 1), as well as the amount to be consumed by each guest, the penalties imposed in cases of disobedience etc. Right on his, the symposiarch’s, given queue, the wine was diluted in water in special big jars (“kraters”), kept at the proper temperature with the use of another special vessel(“psykter”/ wine cooler), which was filled with snow or ice and thrown in the “krater”. 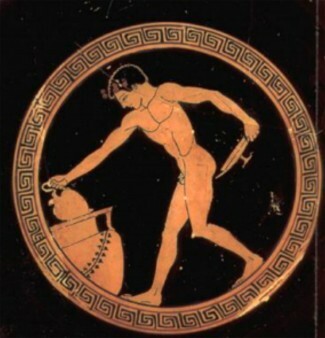 Slaves poured the wine with the “oinοchoe” into the “kylix” and served it with the “tragemata” (titbits). In some instances they began with discussions on some topic of common interest such as love, beauty, philosophy etc. in a set order and continued with puzzles, riddles, contests such as the “cottabos”, the reciting of verses accompanied by a lyre, music played on a flute or cithara, acrobatics, dance, mimeseis et al. Xenophon in his “Symposium” notes that there was a branch of myrtle or laurel that was passed from hand to hand and he who held it had to sing or recite a number of verses playing the lyre. At this point women entertainers (“aulitrides”/flute girls, “orchestrides”/dancing girls, “psalteries”/female harpists”, “hetaires” etc were allowed to enter the “andronas” (men’s apartment). While the private and most of the public symposiums were organized exclusively for men, there were a handful of exceptions concerning the women of ancient Greek families, as for example, the public symposia during the feast of the Thesmophoria held in honour of the goddess Demetra. On the other hand, in Sparta there is evidence of the “sissitia” which were communal meals for the Spartan “homoioi” (warrior peers) held in groups of approximately 15 people. They took place every night and the menu was made up of foods determined by the law, with the “melanas zomos” (black broth) holding pride of place. Each fellow diner was obliged to contribute on a monthly basis certain amounts of food (barley, wine, cheese, figs) and money. When failing to oblige, he was in danger of losing his civil rights. Nowadays, it is obvious that the well known and successfully tested “Mediterranean diet” is based, for the most part, on ancient Greek eating habits. Therefore, today, it would be worth following Plato’s advice on attaining longevity “you should eat barley bread (maza) and wheat bread (artos), olives, cheese, bulbs, vegetables, nuts, figs and pulses”, but also that of Athenaeus who suggests the “Attic fashion of living” (Deipnosophists, IV.137), meaning frugal eating consisting of bread, olives, figs, raisins, honey, greens with olive oil, grapes and apples! 1. Καραμήτρου-Μεντεσίδη, Γ. (2005), Αρχαία Διατροφή: ένα ταξίδι στην τέχνη της γαστρονομίας, Έκδοση Αρχαιολογικού Μουσείου Αιανής, Αιανή, pp. 12, 16. 2. Blanck, H. (2004), Εισαγωγή στην ιδιωτική ζωή των Αρχαίων Ελλήνων και Ρωμαίων, ΜΙΕΤ, Αthens, p. 148. Δαφερέρα, Τ. (2004), Ελλήνων Διατροφή – Μέτρον Άριστον, Εκδόσεις Γραφίδα, Αθήνα, pp. 52-53. Καραμήτρου-Μεντεσίδη, op.sit., pp. 32, 37. Maffre, J.J. (1988), Η ζωή στην κλασική Ελλάδα, Δαίδαλος, Αθήνα, p. 73. Πινγιάτογλου, Σ. (2010), «Τροφή και μαγειρική των αρχαίων Ελλήνων και Ρωμαίων», in Χ. Γκατζόλης (ed. ), Ο Πολιτισμός στο τραπέζι, ΑΜΘ, Thessaloniki, p. 43. Royer, S./Salles, C./Trassard, F. (2005), Η ζωή στην Ελλάδα την εποχή του Περικλή, Πατάκης, Athens, pp. 62-63. Τσακπουνίδης, Ευ. (n.d.), Η διατροφή και η μαγειρική στην αρχαία Ελλάδα, Athens, pp. 18-24. 3. Δαφερέρα, op.sit., pp. 36, 45. Καραμήτρου-Μεντεσίδη, op.sit., p. 20. Royer/Salles/Trassard, op.sit., pp. 64-65. Τσακπουνίδης, op.sit.,pp. 25-29, 48-50. 4. According to Istros in his book Attika: “Attic figs were the best and they should not be exported”, while there was a well known law by Solon forbidding this. 5. Δαφερέρα, op.sit., pp. 47-48. Flaceliere, R. (1999), Ο δημόσιος και ιδιωτικός βίος των αρχαίων Ελλήνων, εκδόσεις Παπαδήμα, Αthens, p. 208. Κολόμποβα, Κ.Μ./Οζερέτσκαϊα, Ε.Λ. (1964), Πώς ζούσαν οι αρχαίοι Έλληνες, Πολιτικές και Λογοτεχνικές εκδόσεις, Αthens, p. 78. Royer/Salles/Trassard, op.sit., pp. 66-67. 6. Δαφερέρα, op.sit., p. 51. Flaceliere, op.sit., p. 209. Maffre, op.sit., p. 74. Royer/Salles/Trassard, op.sit., pp. 68-69. Τσακπουνίδης, op.sit., pp. 6, 33-38. 7. Pork was the cheapest and as we are informed by Aristophanes in his play Ειρήνη (“Peace”, 374), cost approximately 3 drachmas. 8. In some cases it was also offered raw to then be cooked at home by the poorer classes. 9. Flaceliere, op.sit., p. 211. Μήττα, Δ. (2010), «Πότος και συμπόσιο στο πλαίσιο του διονυσιασμού», in Χ. Γκατζόλης (ed. ), Ο Πολιτισμός στο τραπέζι, ΑΜT, Thessaloniki, p. 59. Μπόσκου, Γ./Παλησίδης, Γ. (2010), «Οι Έλληνες και η αίσθηση της γεύσης», Αρχαιολογία και Τέχνες 115, pp. 6-13. Πινγιάτογλου, op.sit., pp. 45-46. Royer/Salles/Trassard, op.sit., pp. 70-71. 10. Flaceliere, op.sit., p. 206. Κολόμποβα/Οζερέτσκαϊα, op.sit., p. 86. 11. Δαφερέρα, op.sit., pp. 36, 41. Flaceliere, op.sit., pp. 213-215, 222. Κολόμποβα/Οζερέτσκαϊα, op.sit., pp. 88-93. Maffre, op.sit., p. 70. Μήττα, op.sit., pp. 53-54, 57, 62. Royer/Salles/Trassard, op.sit., p. 74. Στεφανή, Ευ./Σολομών, Ε. (2010), «Ο άνθρωπος είναι ό,τι τρώει… Προσεγγίσεις στην ιστορία της διατροφής», in Χ. Γκατζόλης (ed. ), Ο Πολιτισμός στο τραπέζι, ΑΜT, Thessaloniki, p. 19. Blanck, H. (2004), Εισαγωγή στην ιδιωτική ζωή των Αρχαίων Ελλήνων και Ρωμαίων, ΜΙΕΤ, Athens. Δαφερέρα, Τ. (2004), Ελλήνων Διατροφή – Μέτρον Άριστον, εκδόσεις Γραφίδα, Athens. Flaceliere, R. (1999), Ο δημόσιος και ιδιωτικός βίος των αρχαίων Ελλήνων, εκδόσεις Παπαδήμα, Athens. Καραμήτρου-Μεντεσίδη, Γ. (2005), Αρχαία διατροφή: ένα ταξίδι στην τέχνη της γαστρονομίας, έκδοση Αρχαιολογικού Μουσείου Αιανής, Αιανή. Κολόμποβα, Κ.Μ./Οζερέτσκαϊα, Ε.Λ., (1964), Πώς ζούσαν οι αρχαίοι Έλληνες, Πολιτικές και Λογοτεχνικές Εκδόσεις, Athens. Maffre, J.J. (1988), Η ζωή στην κλασική Ελλάδα, Δαίδαλος, Athens. Μήττα, Δ. (2010), «Πότος και συμπόσιο στο πλαίσιο του διονυσιασμού», in Χ. Γκατζόλης (ed. ), Ο πολιτισμός στο τραπέζι, ΑΜΘ, Thessaloniki, pp. 51-69. Μπόσκου, Γ./Παλησίδης, Γ. (2010), «Οι Έλληνες και η αίσθηση της γεύσης», Archaeology and Arts 115, pp. 6-13. Πινγιάτογλου, Σ. (2010), «Τροφή και μαγειρική των αρχαίων Ελλήνων και Ρωμαίων», in Χ. Γκατζόλης (ed. ), Ο πολιτισμός στο τραπέζι, ΑΜΘ, Thessaloniki, pp. 39-50. Royer, S./Salles, C./Trassard, F. (2005), Η ζωή στην Ελλάδα την εποχή του Περικλή, Πατάκης, Athens. Στεφανή, Ευ./Σολομών, Ε. (2010), «Ο άνθρωπος είναι ό,τι τρώει… Προσεγγίσεις στην ιστορία της διατροφής», in Χ. Γκατζόλης (ed. ), Ο πολιτισμός στο τραπέζι, ΑΜΘ, Thessaloniki pp. 9-24. Τσακπουνίδης, Ευ. (n.d.), Η διατροφή και η μαγειρική στην αρχαία Ελλάδα, Athens.